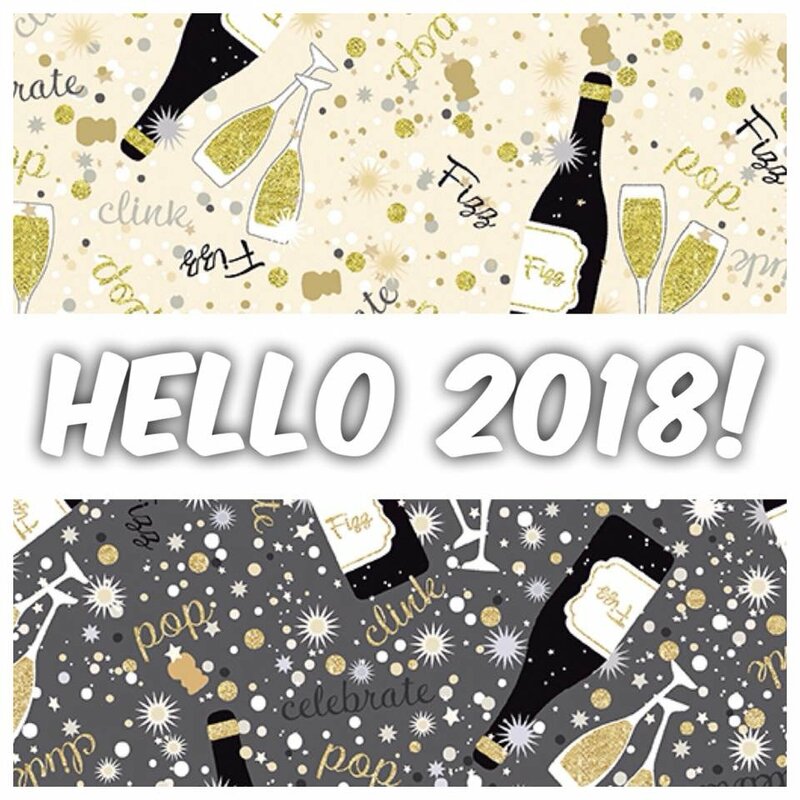 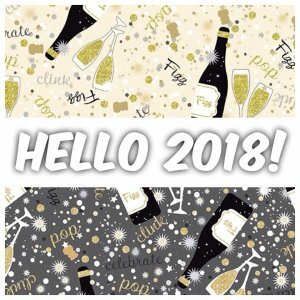 Ringing in the new year with some champagne fabric! 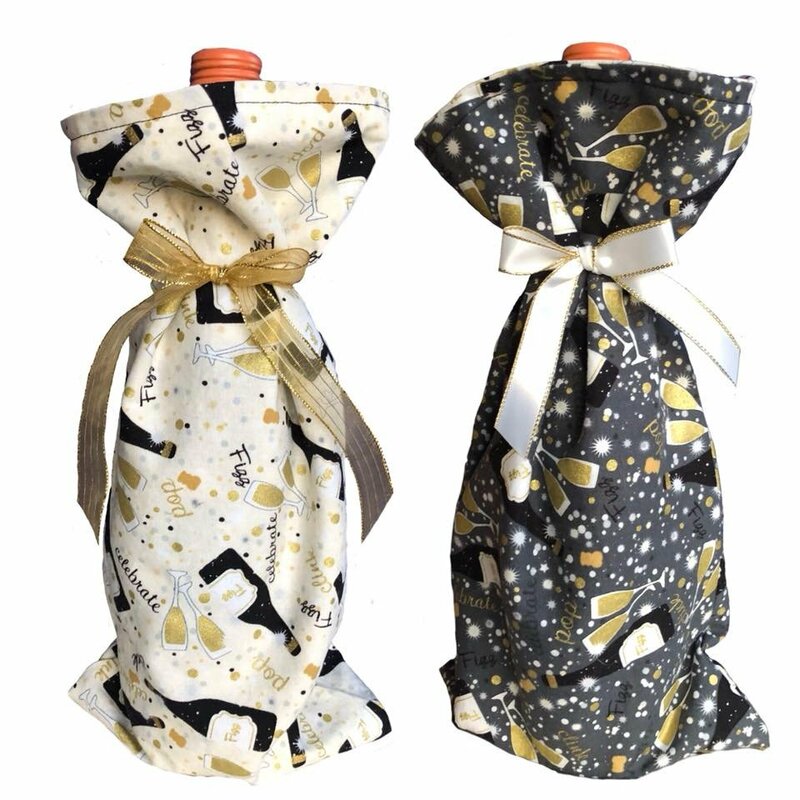 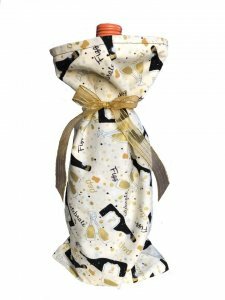 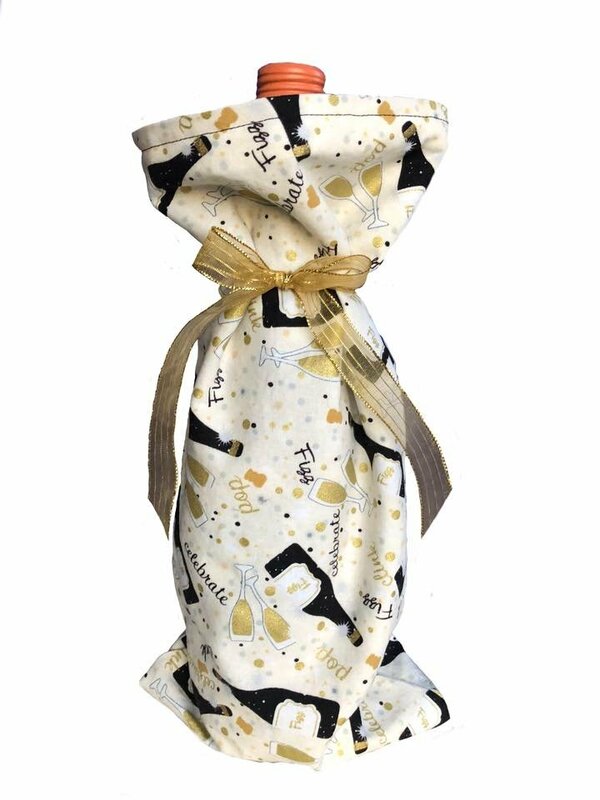 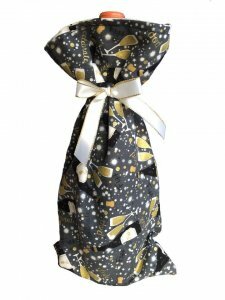 Jackie made this reversible wine bag to jazz up a bottle she brought to her in-law’s house. 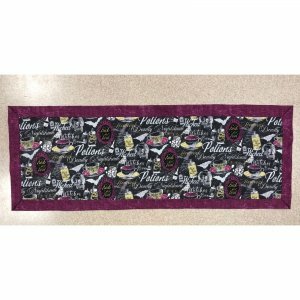 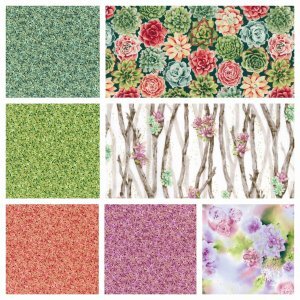 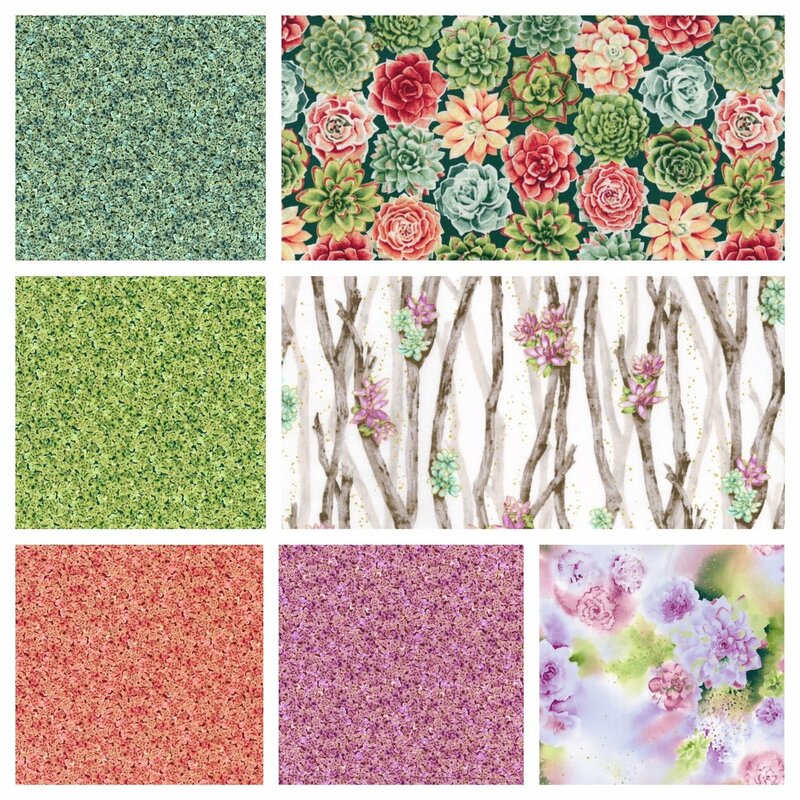 This fabric is versatile enough that it can be used for other special occasions as well. 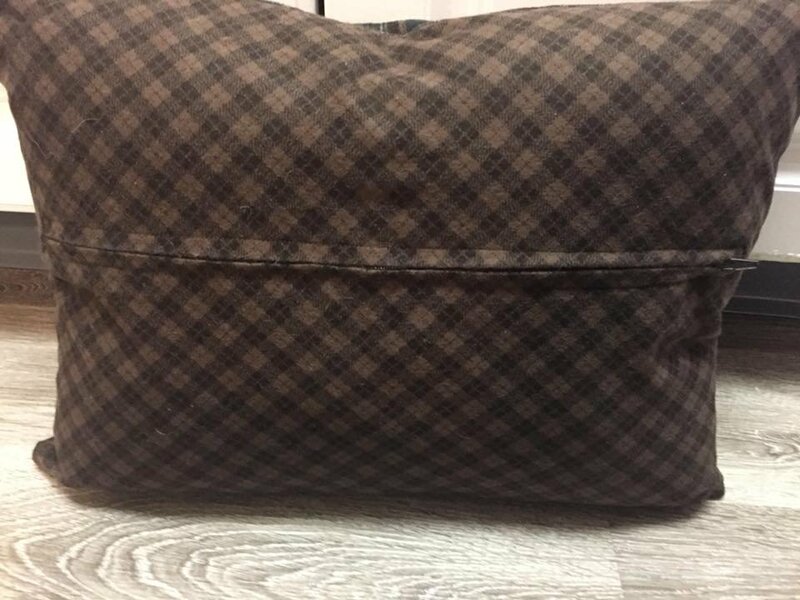 JoAnne’s grandfather requested that she make him another cover for his favorite head pillow that he uses while watching TV. 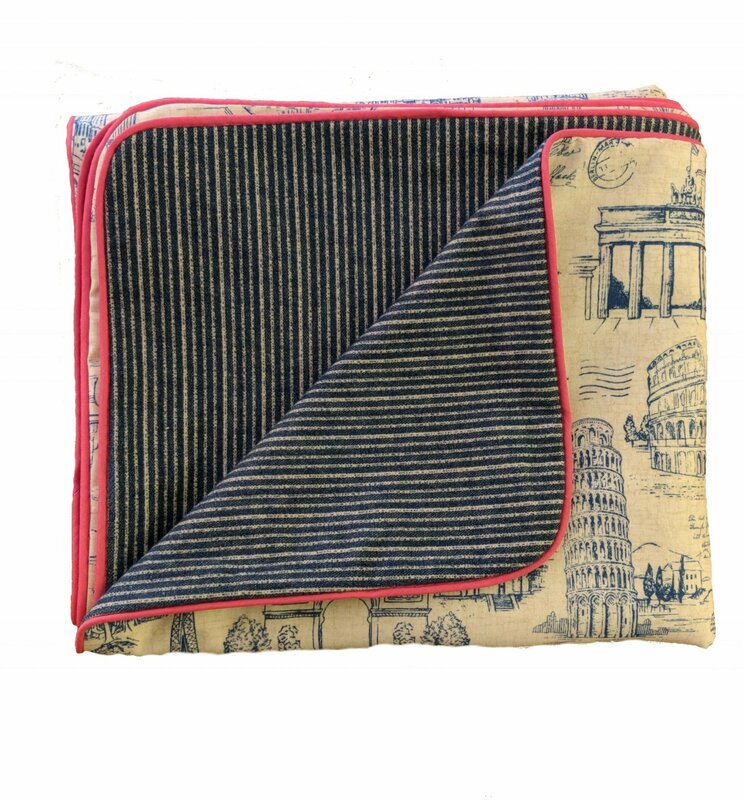 By the looks of the previous cover, it surely gets a lot of use. (haha) She couldn’t decide between this flannel combo or a fishing themed one, so she decided to make both! 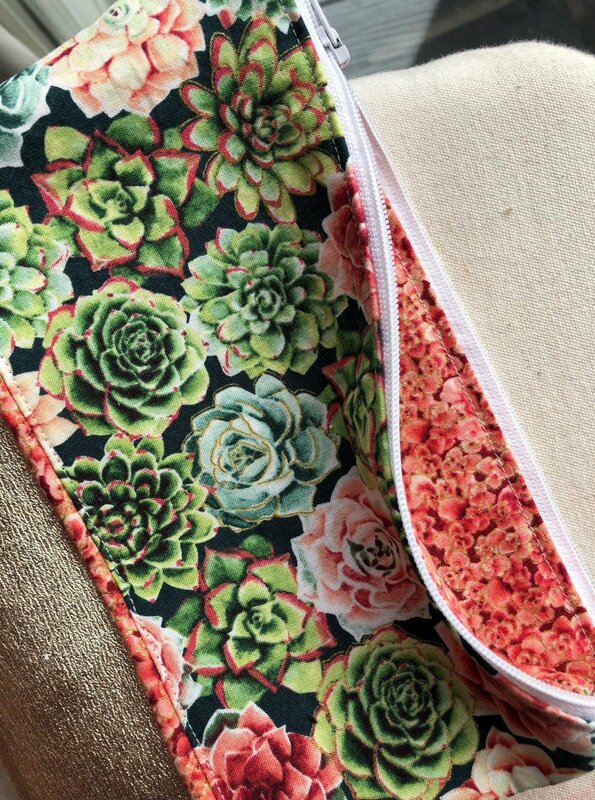 They came together quickly and we think the zippers give them a finished look. 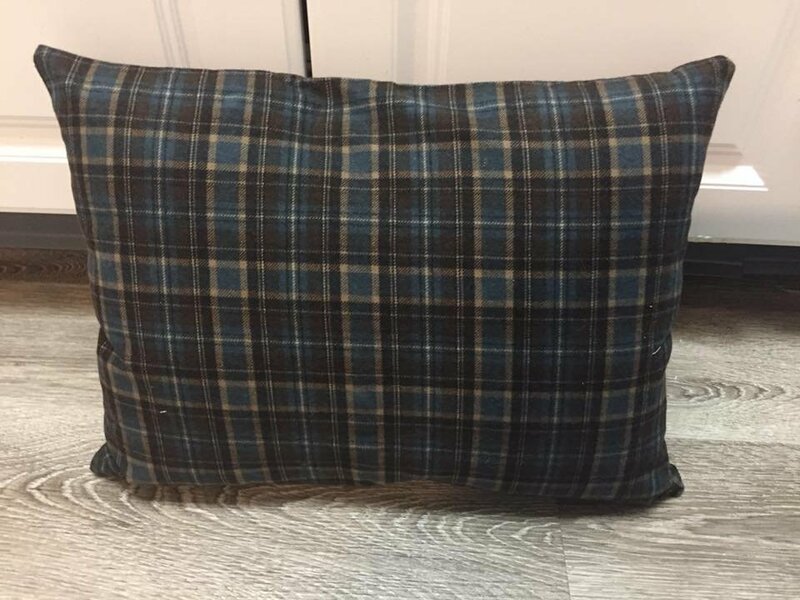 Pillow measures 14" x 18" and 14" coordinating brown/black zippers were used. Who wore it better? 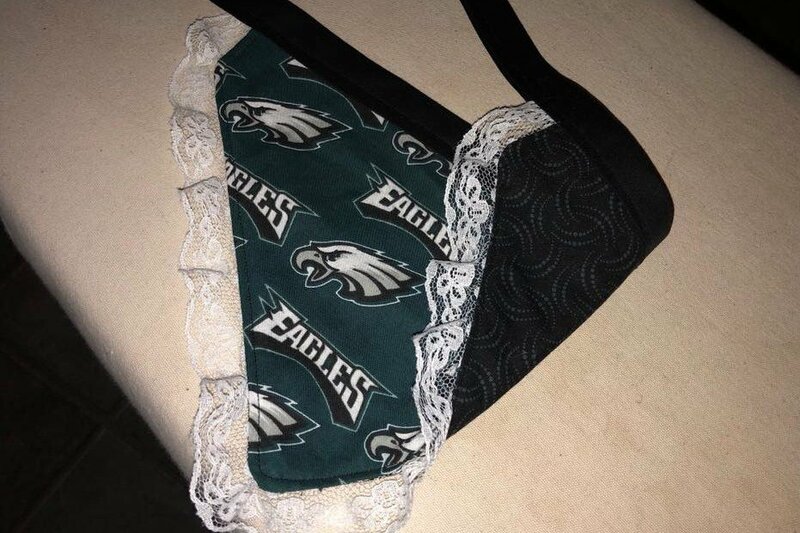 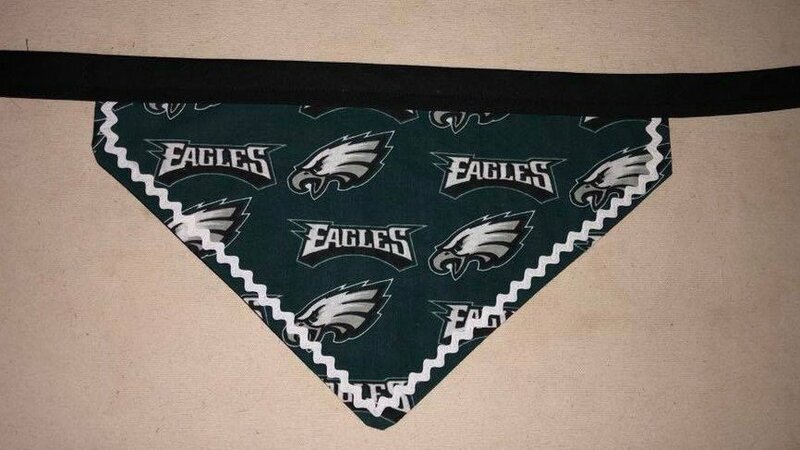 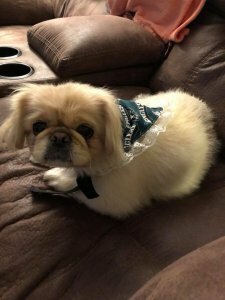 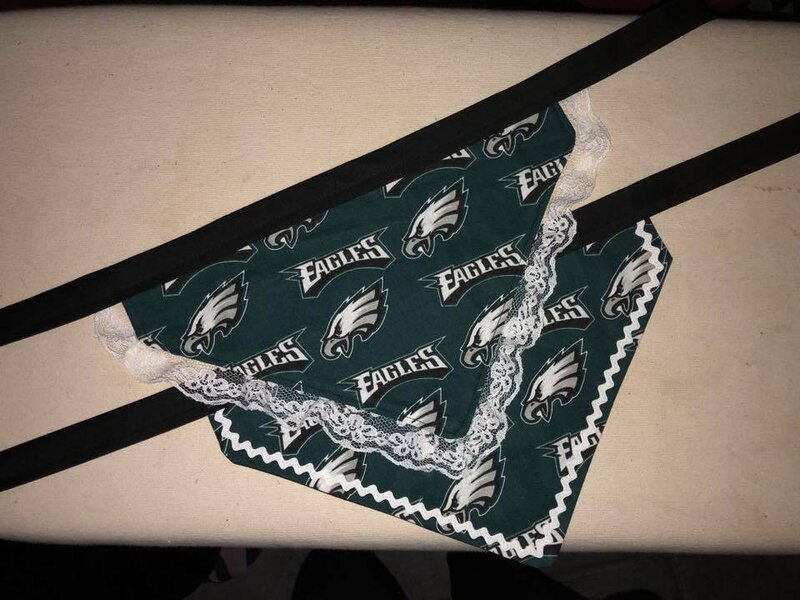 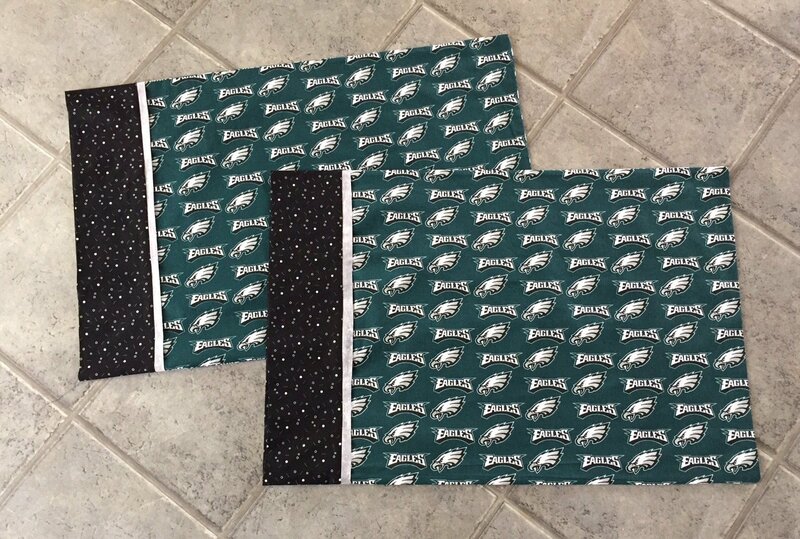 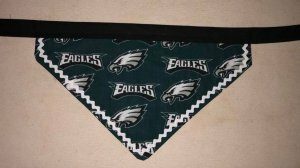 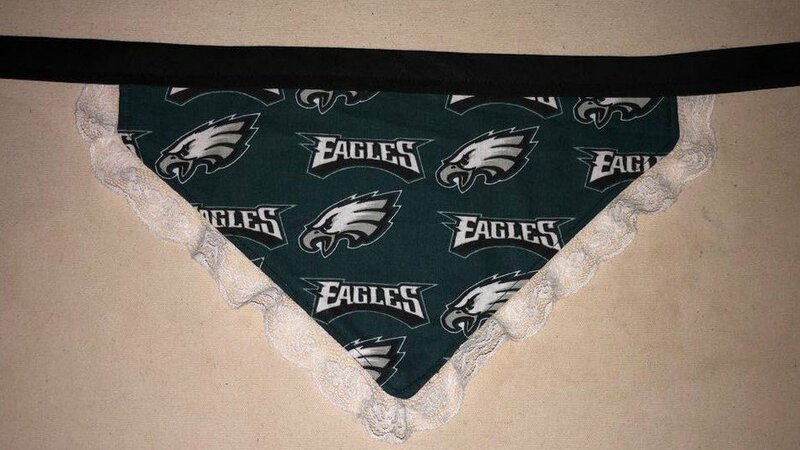 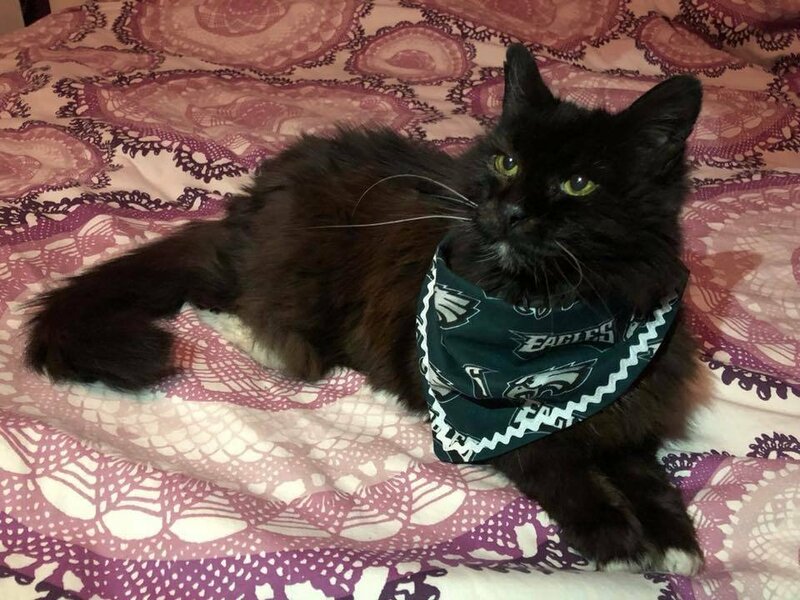 Jackie made a couple of Eagles bandanas for our furry friends to wear while they watched the Super Bowl. Aren’t they such little models? 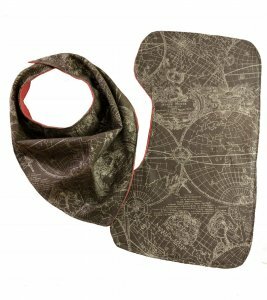 Both were made from 100% cotton material and lined with coordinating dark geometric dot fabric. 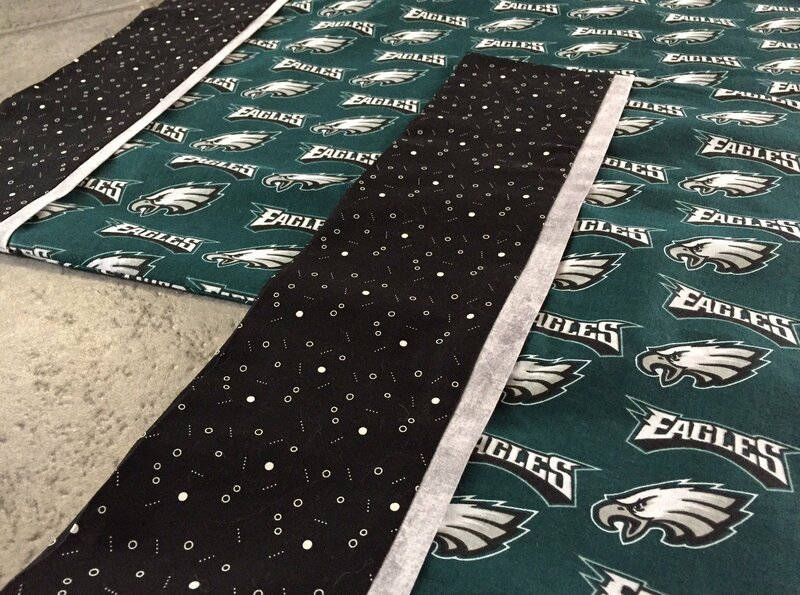 Each measures 7" x 12" at the widest points. 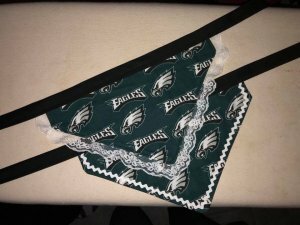 Double fold bias tape was used to make simple ties. One was embellished with white ric rac while the other featured a white, scalloped lace trim. 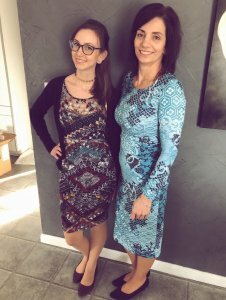 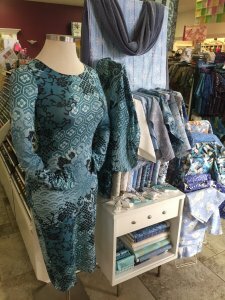 Lisa made the dress below using a McCall's pattern with a stretch knit fabric. 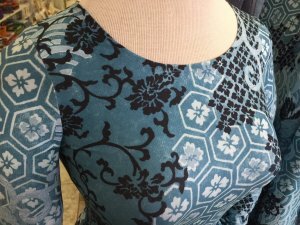 She chose to make it long sleeves but used narrow elastic to ruche the bottom of the sleeves up her wrist. 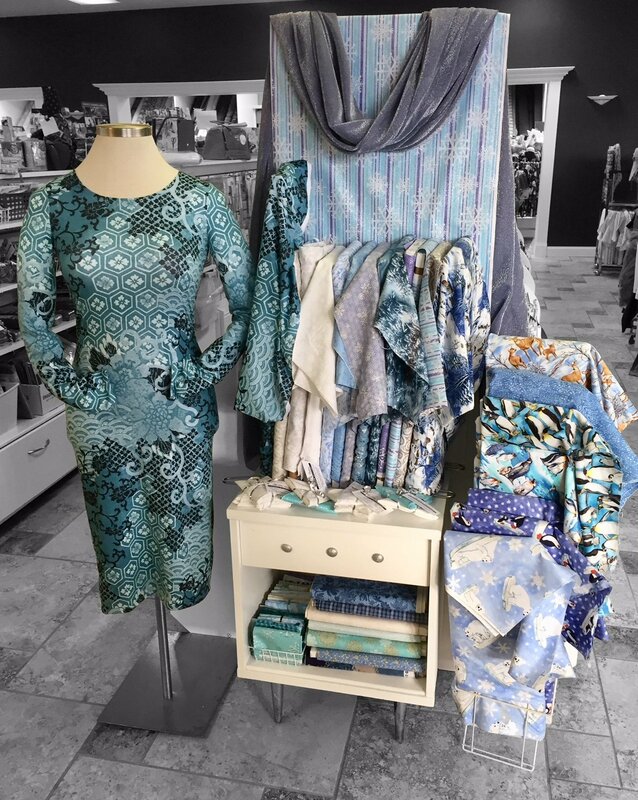 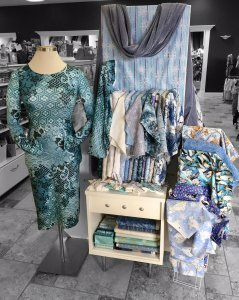 It was the perfect print and color for the winter wedding she attended. 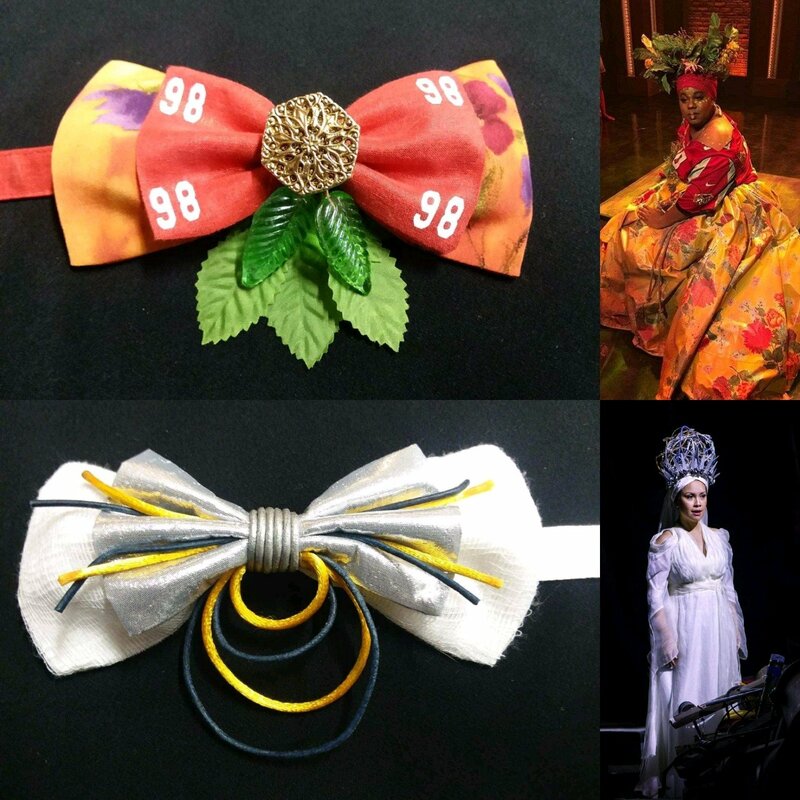 Even Ophelia (our dressform) looked great in it. 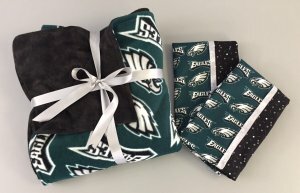 These items were made for a local family's fundraiser. 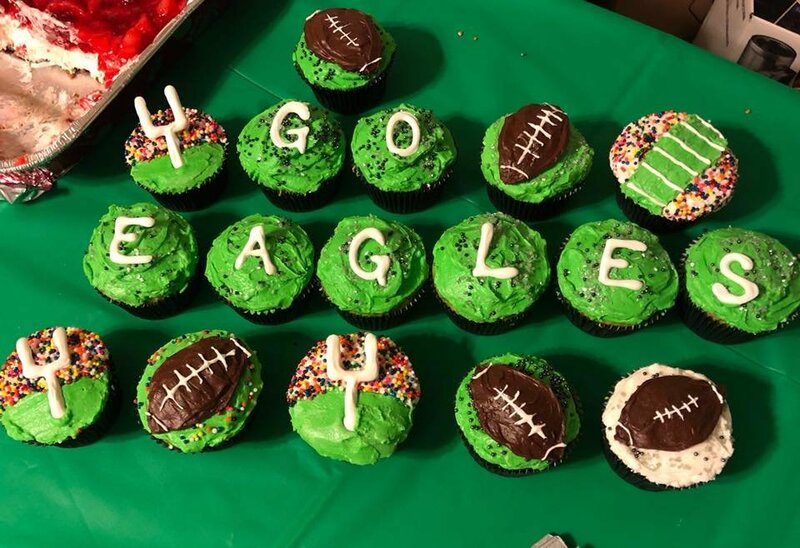 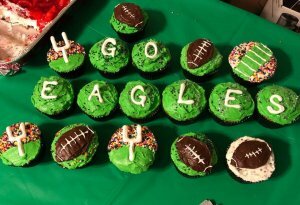 The basket was stuffed with a few Eagles goodies made by Jo. 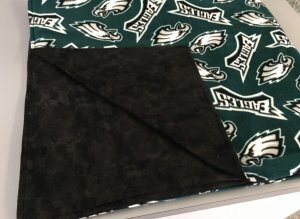 It included a throw (approx. 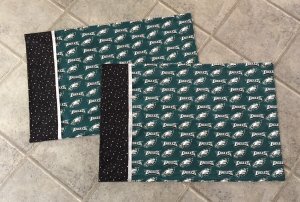 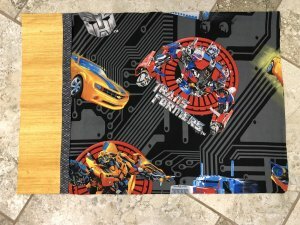 54" x 60") and two pillow cases. 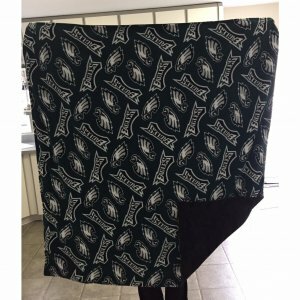 The throw was made of fleece and lined with wide-back flannel. 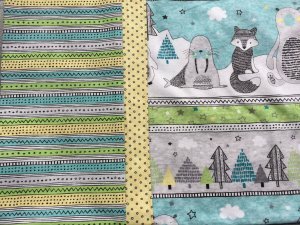 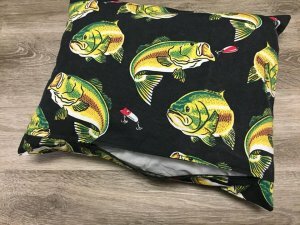 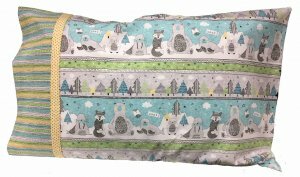 The pillowcases are 100% cotton with coordinating prints. 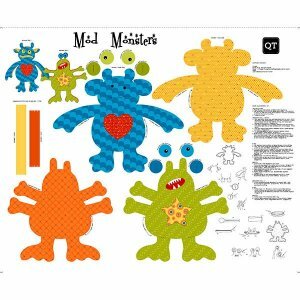 These cute little guys were made up using the Mod Monsters panel from Quilting Treasures. 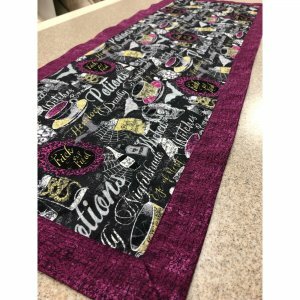 They go together pretty quickly with easy to follow directions and a few notions. 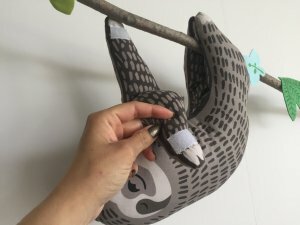 All you need is matching thread, some stuffing, and Poly-pellets (or something similar) to add weight to the bottom and feet. This helps the monsters sit up. 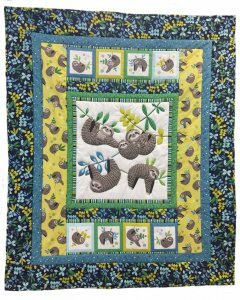 The bellies were stitched around using batting to create a little dimension. 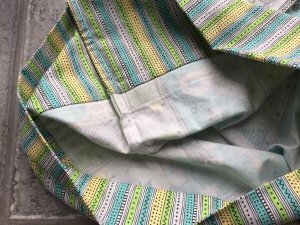 Most of the sewing can be done by machine. The eyes were the only hand-sewn item put on at the end of the project. 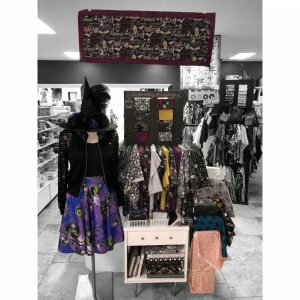 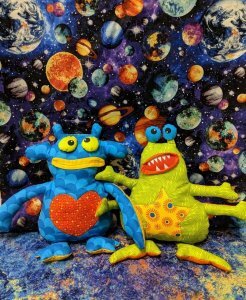 We turned our monsters into martians by putting them in front of our new Out of this World fabric collection. 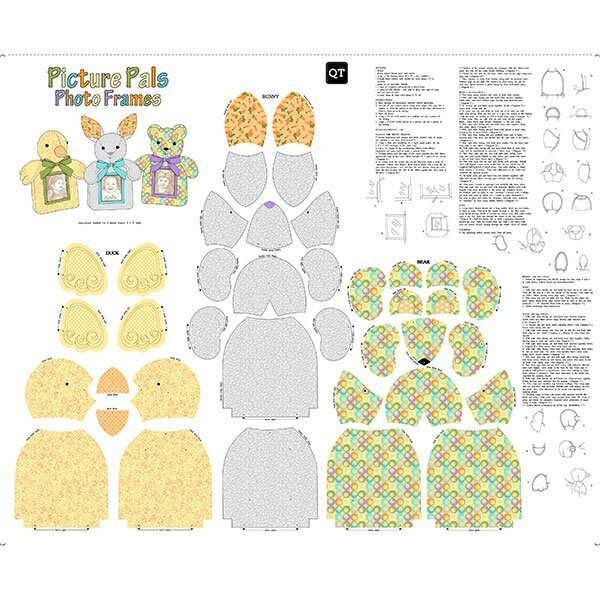 The picture pals are a quick panel project featuring a duck, bunny, and bear. 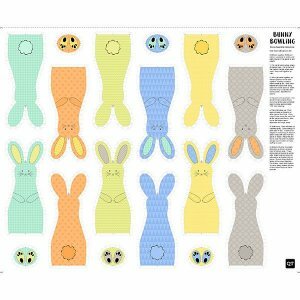 Each stands at approximately 8 1/2" high with a 3x4" clear vinyl frame on the front. 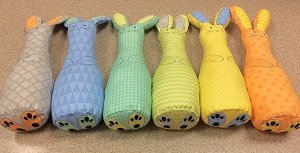 Other than the panel, you will need a few other notions that include ribbon, buttons for the eyes, stuffing, and poly pellets. 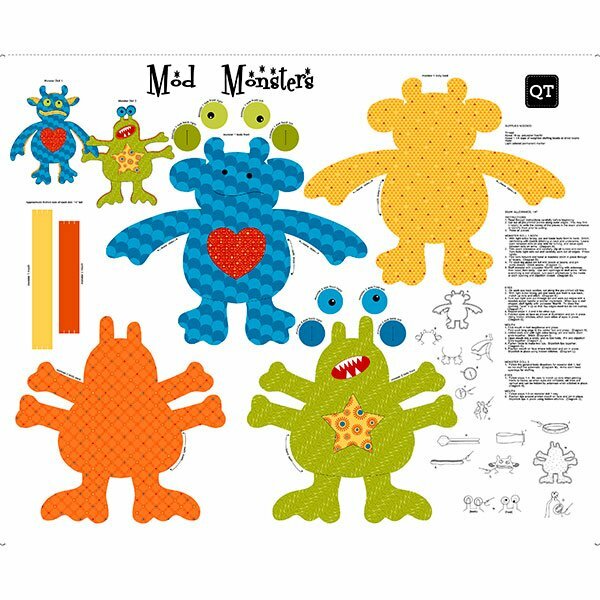 They have easy to follow instructions making this a great gift idea for a child in your life. 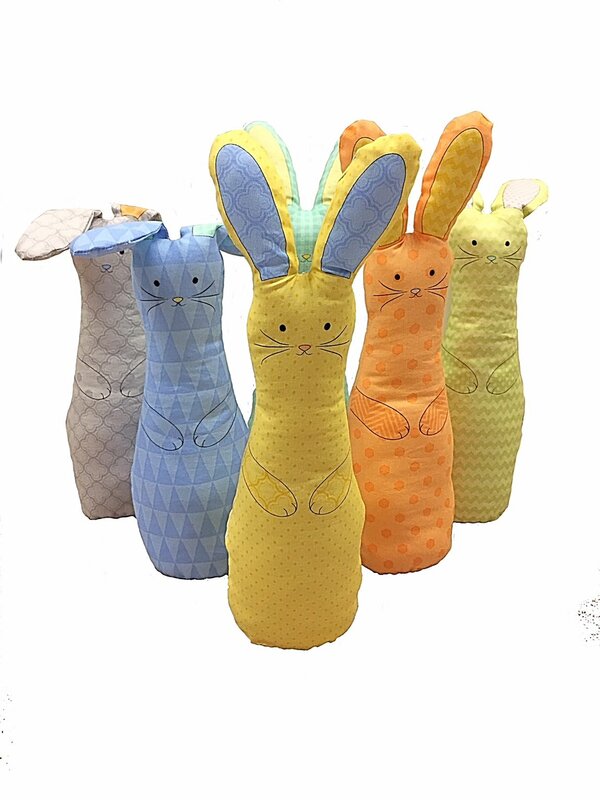 They would be perfect to feature a photo of a relative for the baby to look at! 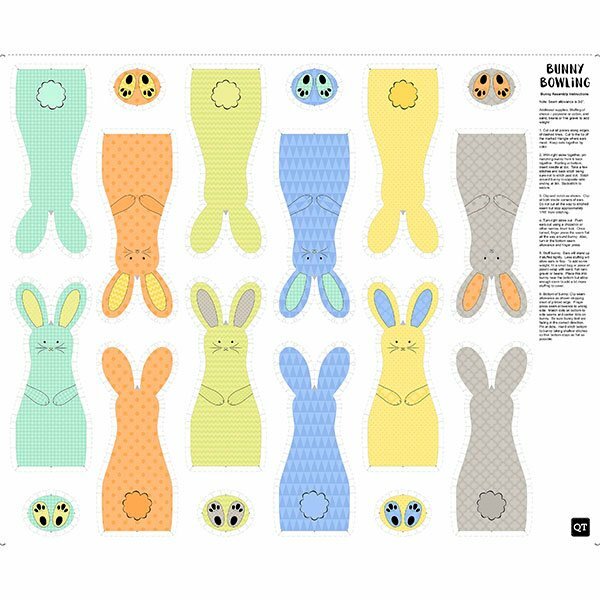 This Bunny Bowling Panel is a quick project that would make a good gift for Easter. 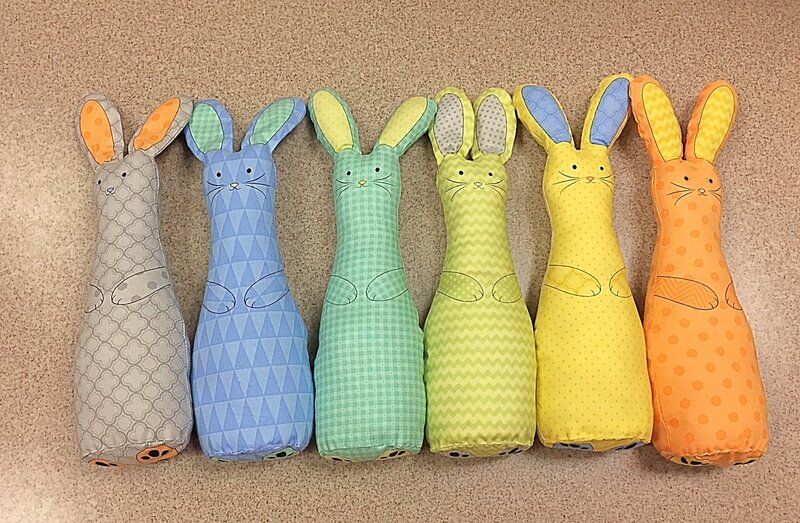 Grab a ball and use them as bowling bunnies or split them up as individual gifts. 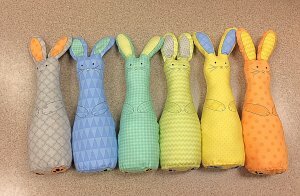 Each panel comes with 6 unique bunnies. 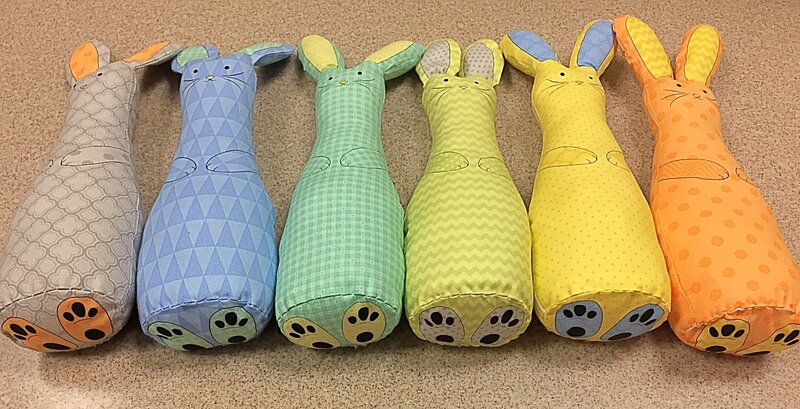 We stuffed ours with Poly-fil and put a little bag of Poly-pellets in the bottom to help them stand up. 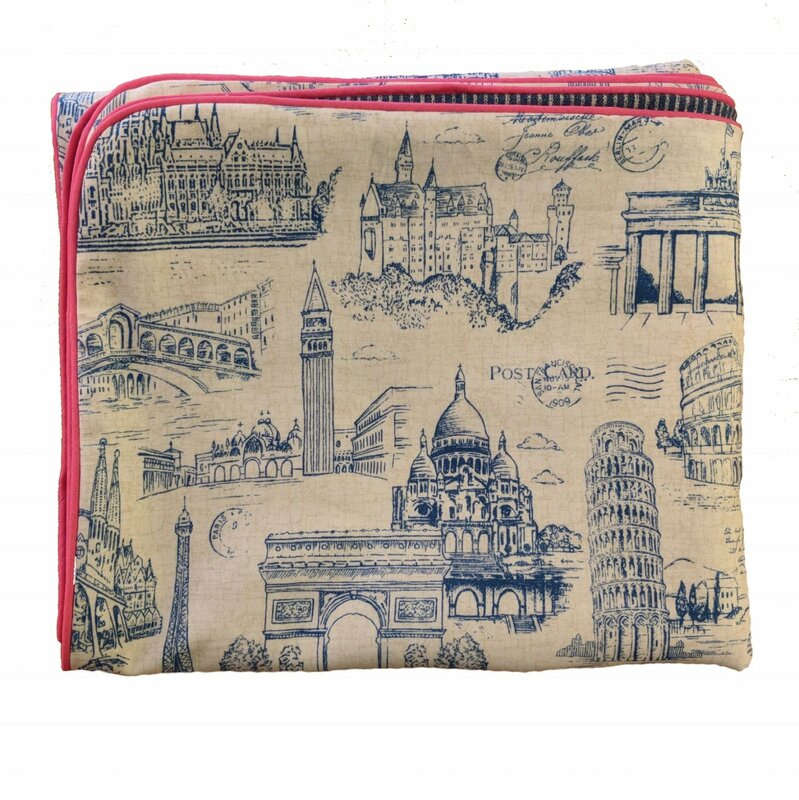 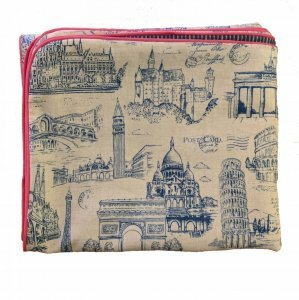 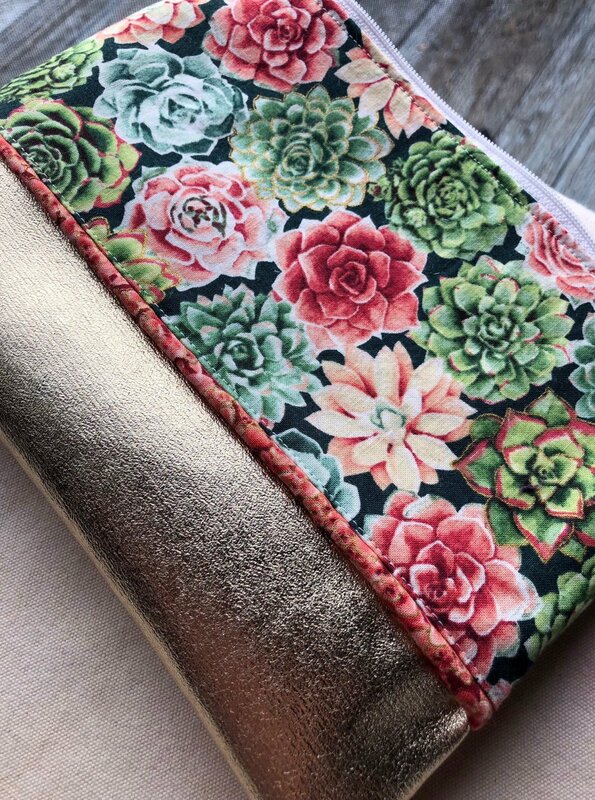 Jackie made this cute makeup bag from our Oasis collection. 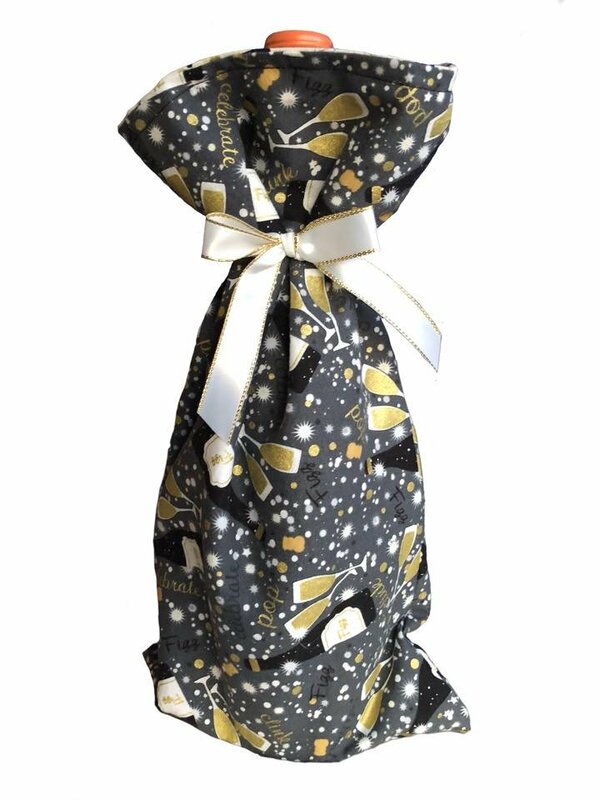 The gold vinyl on the bottom is soft enough to sew easily but sturdy enough to give the bag structure. The color picks up on some of the gold undertones in the fabric. We just love the pop of color in the lining and her handmade piping! 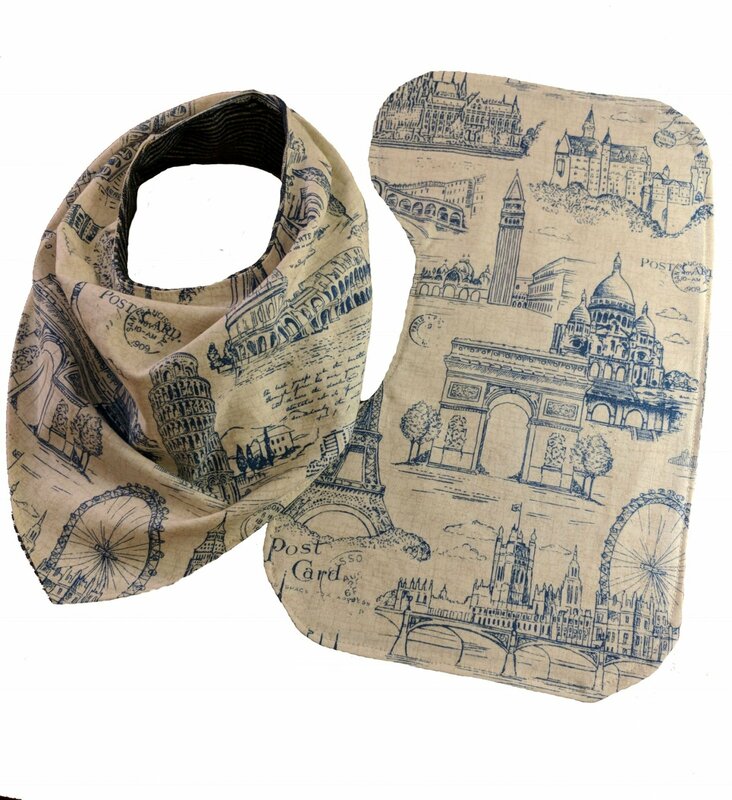 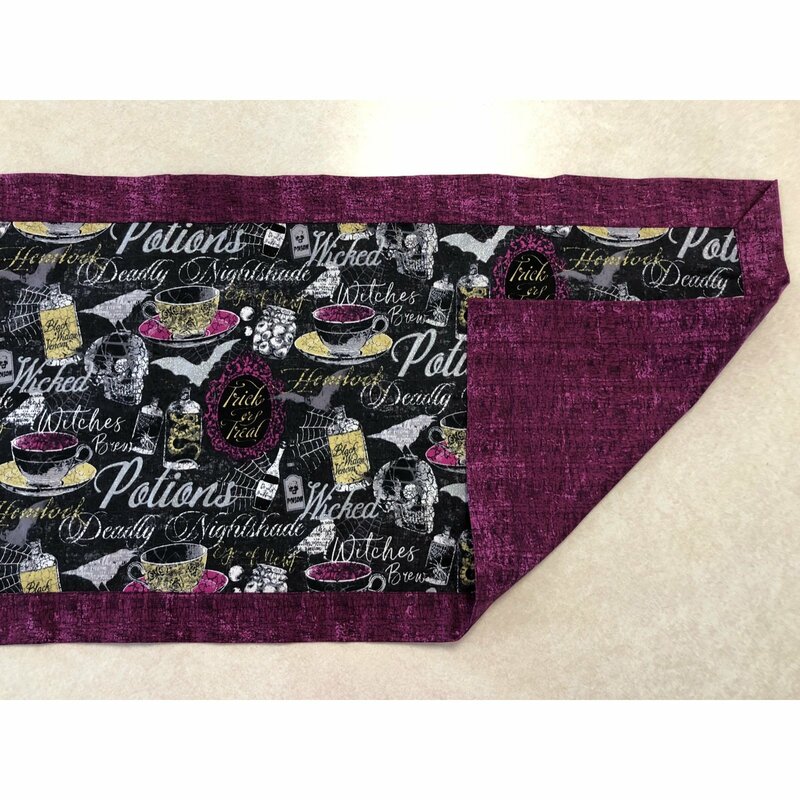 Each kit includes a 2 placemat and napkin sets. 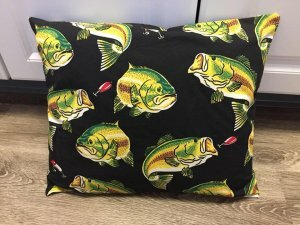 Original pattern; designed and sewn by Lisa Mainiero. 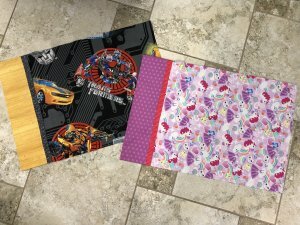 project is a quick and easy project great for beginners. 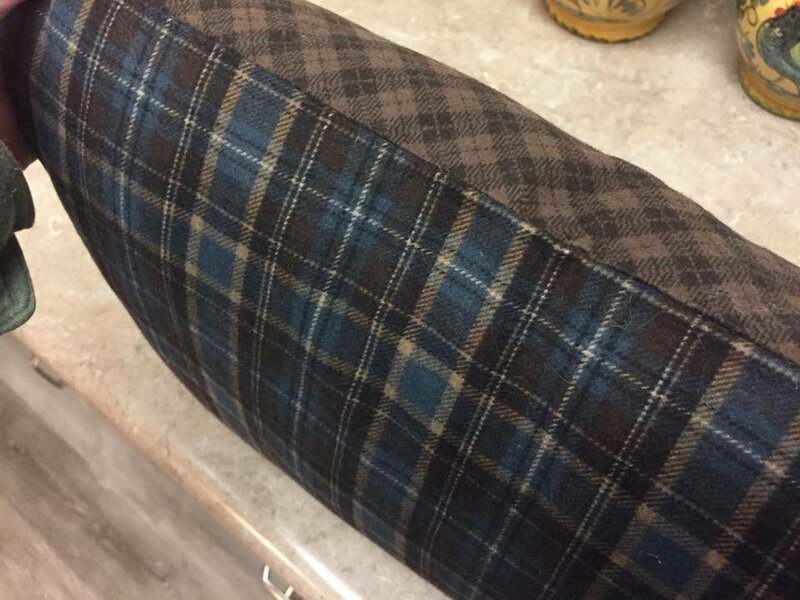 We used a french seam technique on our pillowcase to hide the inside raw edges. 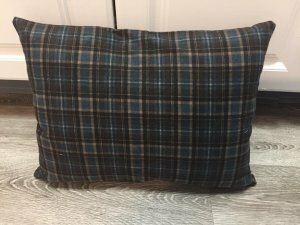 Pillows can also be finished using a serger or a zig-zag stitch. Adriana made this baby gift set for her cousin who had a travel-themed baby shower. The prints we had worked perfectly for her colors and theme. 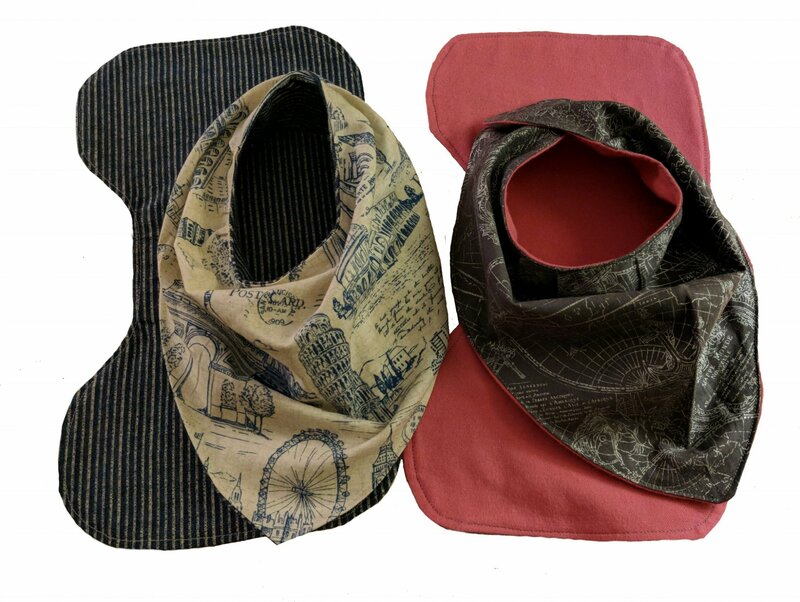 The set includes two bandana bibs, two burp cloths, and a receiving blanket. 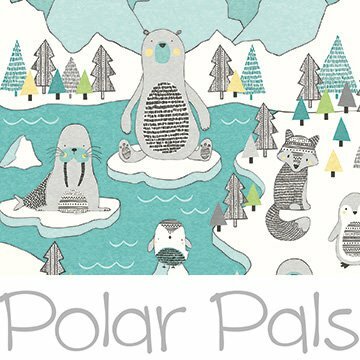 They are made with 100% cotton prints and backed with coordinating flannels. The receiving blanket has pink piping to tie it all together. 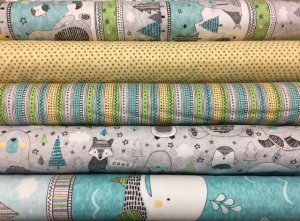 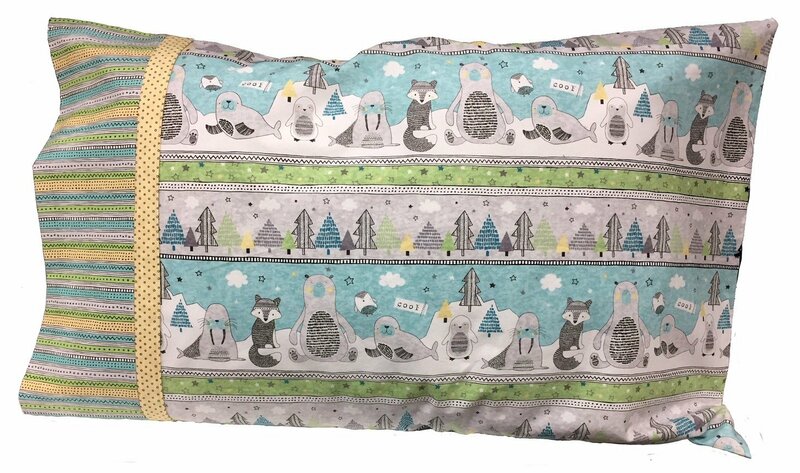 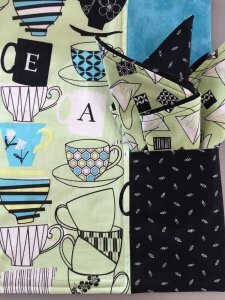 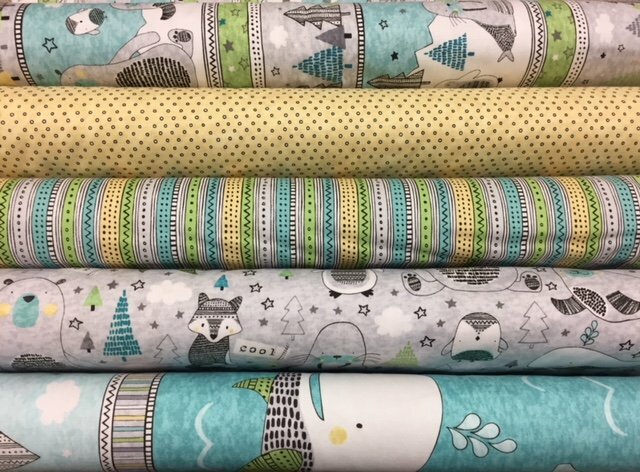 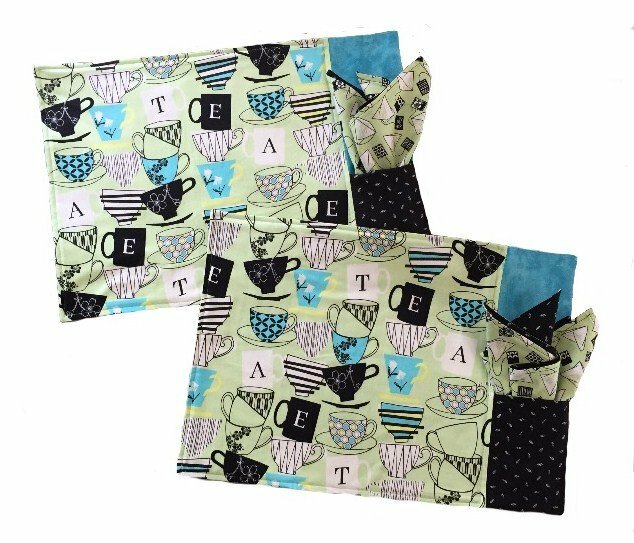 A hand-made item is always a great addition to a baby shower gift, and because they are made from quality cotton fabrics, these can be washed and used again and again! 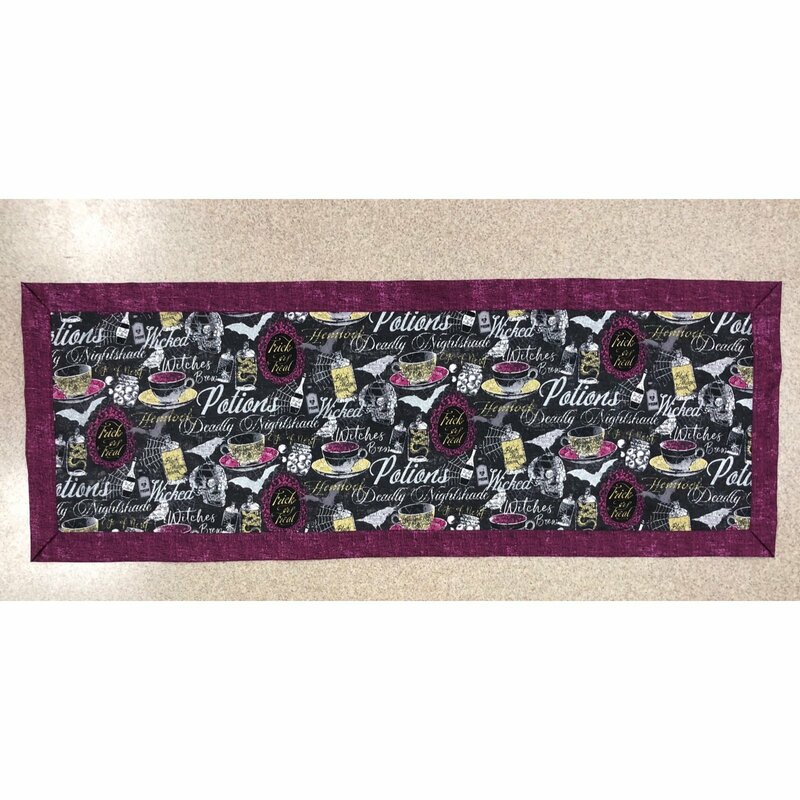 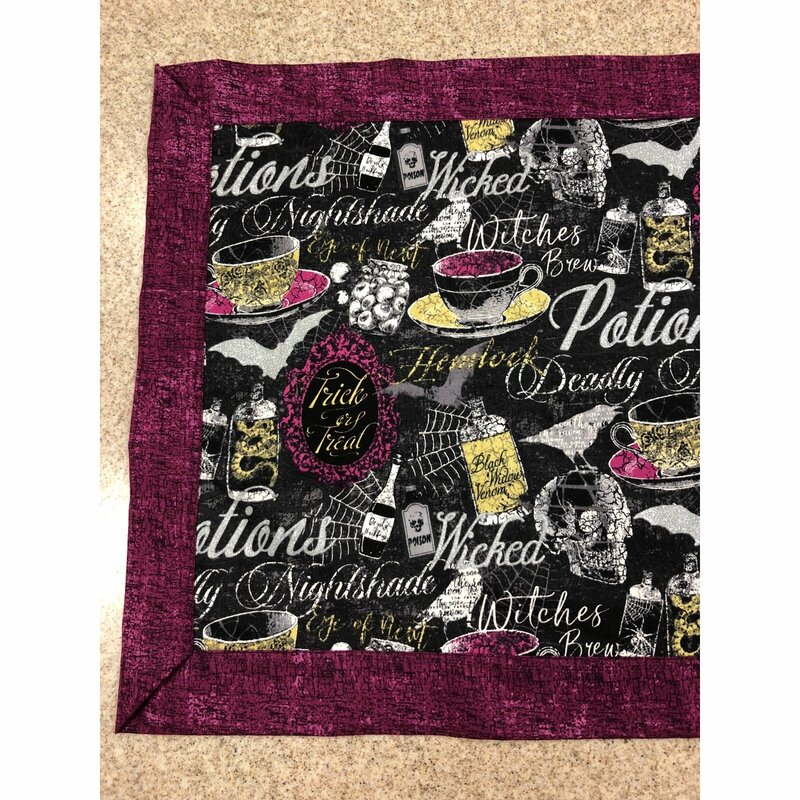 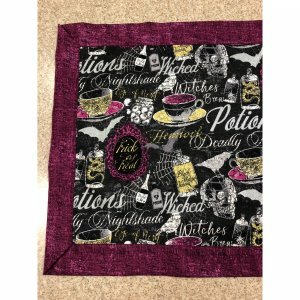 This is the table runner we made out of our new "Elegantly Frightful" Halloween fabric collection. 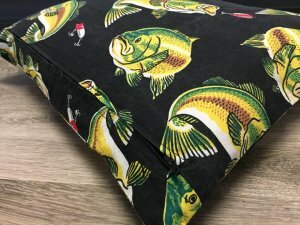 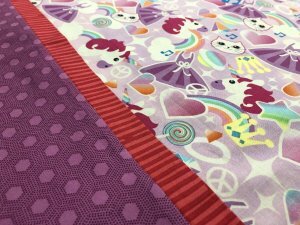 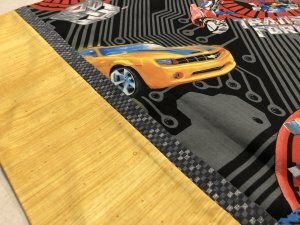 This project came together quickly with just a few seams! 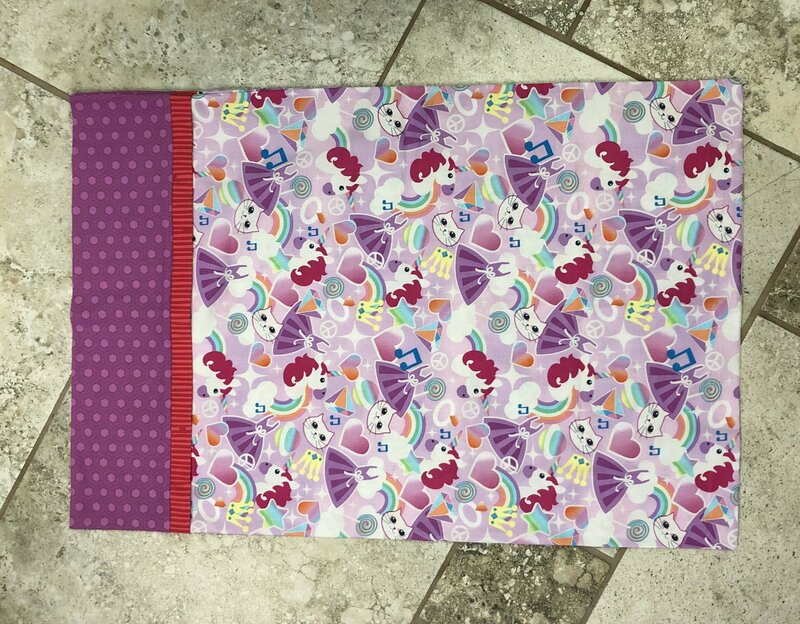 The purple border wraps around the back as lining. It measures 14" x 39". 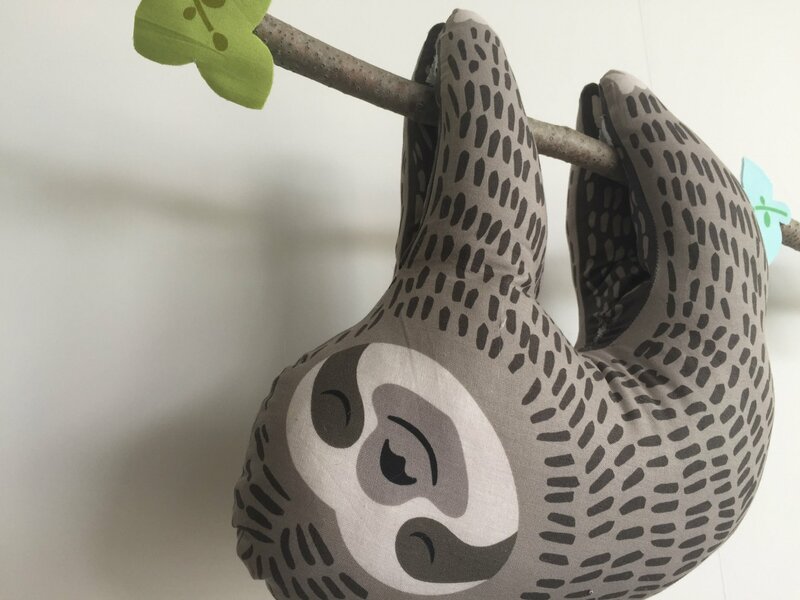 "Hanging Out" pattern using the Sleepy Sloth collection from Northcott Fabrics. 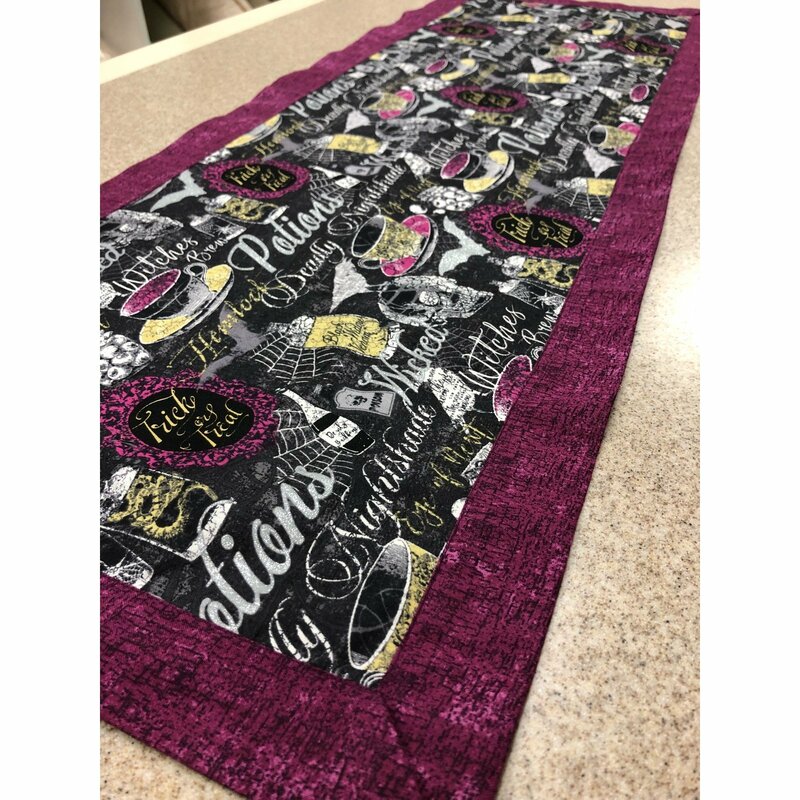 Measurements are 47" x 56". 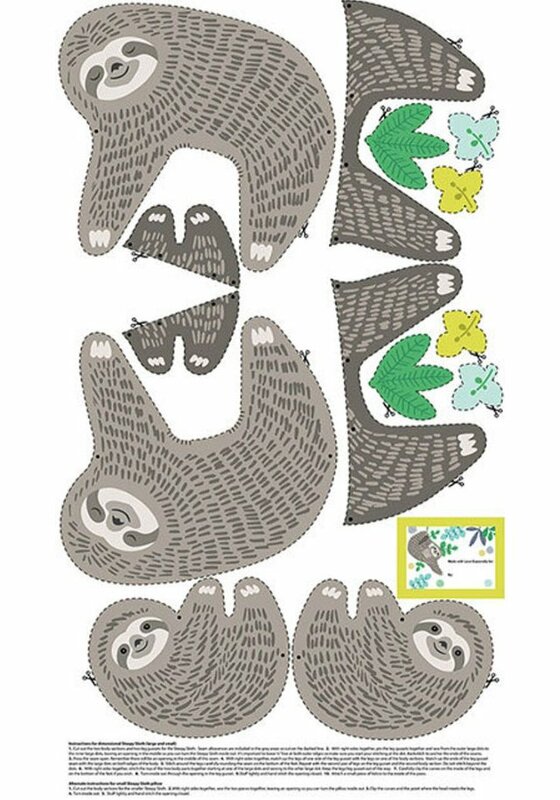 We used two layers of batting behind the sloths to help them stand out more compared to the background. The center panel allows the quilt to come together quickly. 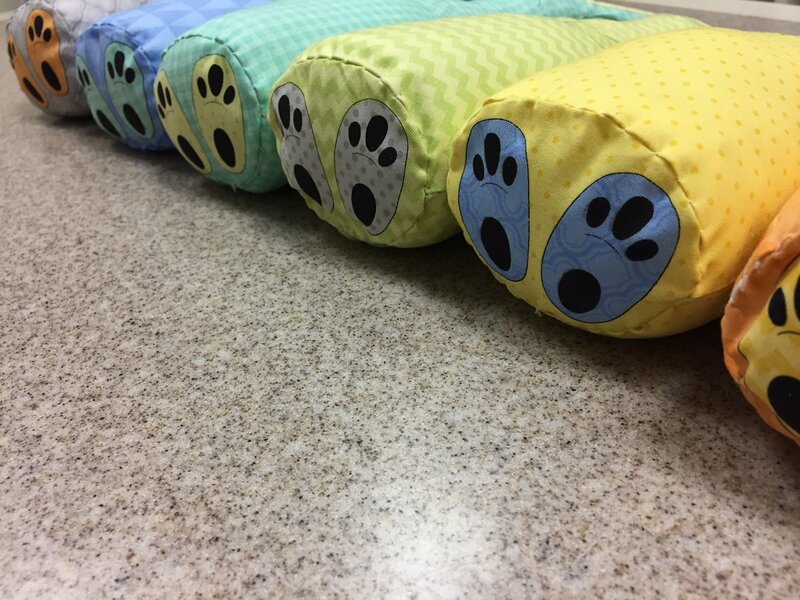 Great for babies and kids! 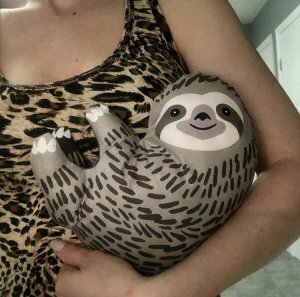 Sloth stuffed animal panels now available! 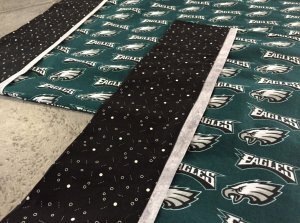 These panels come together easily with just a few steps. 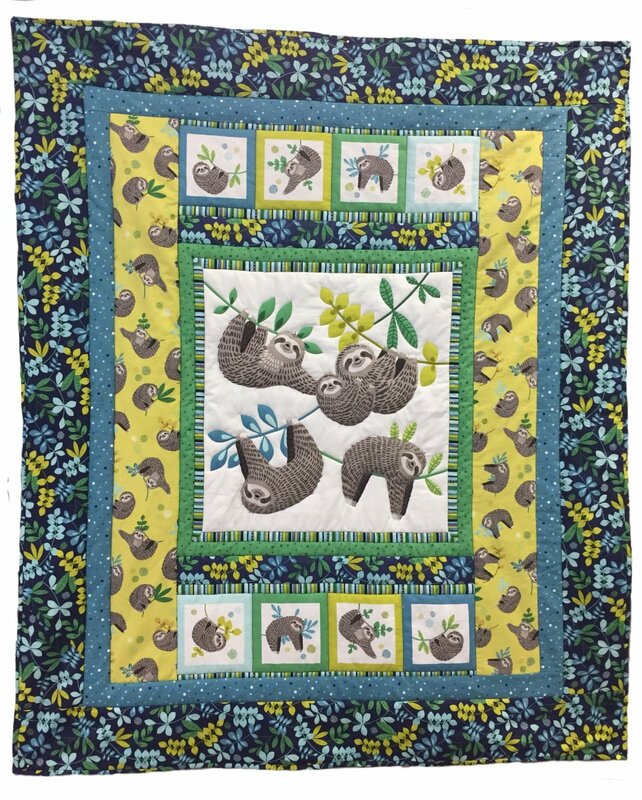 Each panel includes a Mom and baby sloth and various leaves. 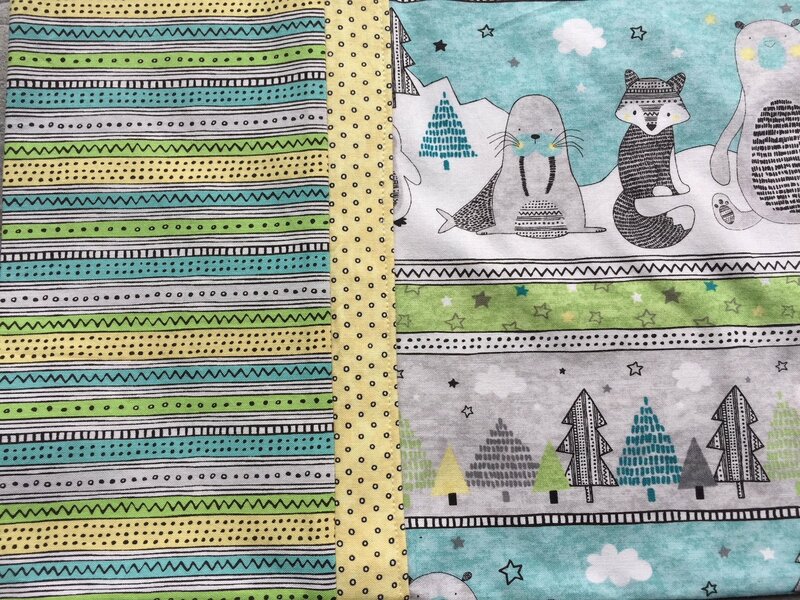 It also includes a quilt tag on it. 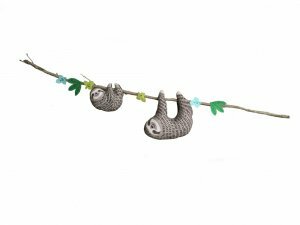 The pattern calls for velcro on the sloths feet so that they can easily hang from a dowel. 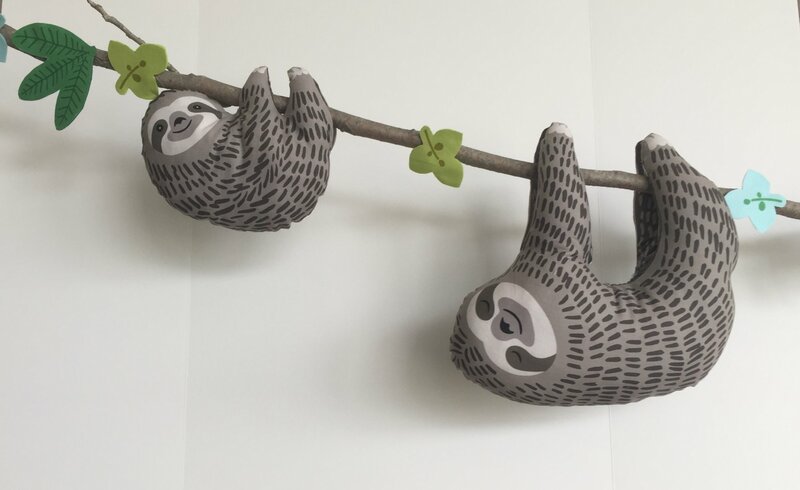 For our sloth display, we decided to use a tree branch from outside instead of a dowel. 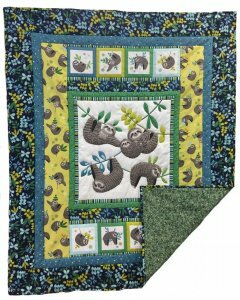 Leaves were backed with Heat'n Bond and put on green felt to make them more sturdy. 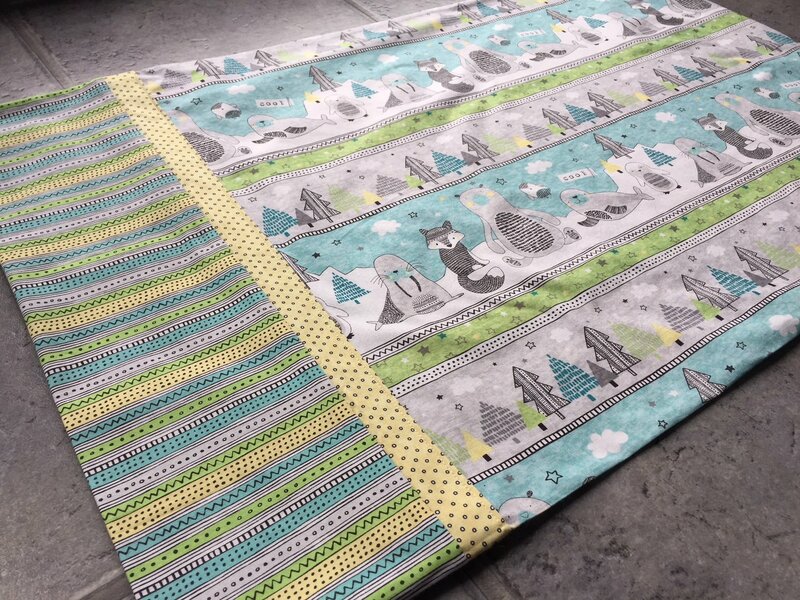 These panels would be great for a baby or kids room and can easily be removed from the dowels to play with! 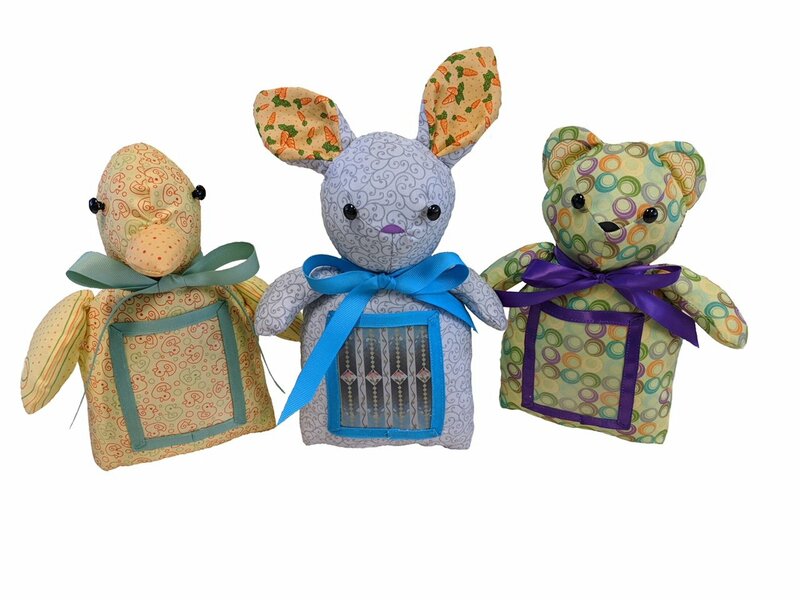 Some quick last minute holiday gifts for kids. 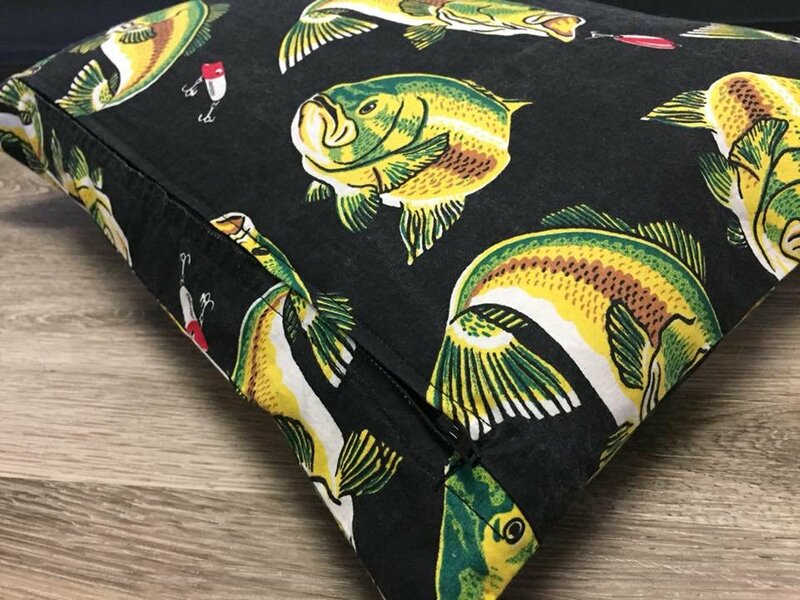 We used french seams to finish off the inside of the pillows so that no raw edges are showing. In less than a half hour, you can have a great stocking stuffer! 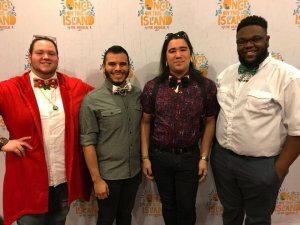 Shaun made these bow ties for his friends trip to NY to see the musical Once on this Island. Each is uniquely representative of one of the four Gods in the story. 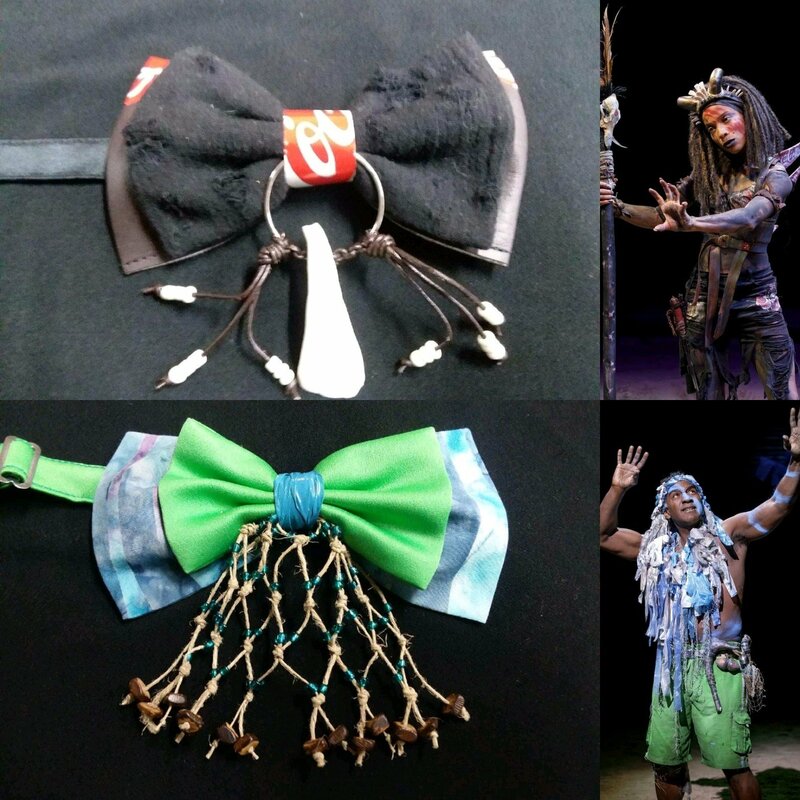 In the photos, we referenced the characters to show the amazing detail that was put into each bow tie. Pictured from left to right (with their symbolic character names) -- John (Asaka), Christian (Erzulie), Shaun (Papa Ge), Domonic (Agwe) -- the guys rocking their bows at the show! 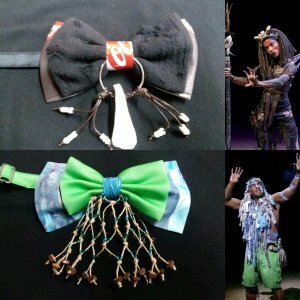 Amazing work Shaun, as always!